A yummy, light and airy hot pudding. Preheat the oven to 200C, gas mark 6. Heat the butter in a large frying pan, add the apple quarters and muscovado sugar and cook over a high heat for 5 minutes until the apple is lightly browned. 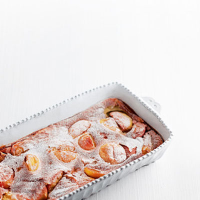 Tip the apple and all the juices into a large ovenproof dish, making sure the pieces sit in a single layer. Using an electric whisk, beat the eggs and vanilla sugar until pale and voluminous, then whisk in the flour, milk and a pinch of salt. Pour the whisked mixture round the apples then place the dish on a baking sheet and bake for 30 minutes until puffed, golden brown and just set. Dust with icing sugar and serve with cream or ice cream. This recipe was first published in February 2009.